How to share calendar in Outlook 2016/2013/2010/2007? Working on office tasks very often requires sharing one’s Outlook calendar with other people. If you want to get things done quickly and efficiently, it is a good idea to share your calendar across a company. Why? Simply because your co-workers can check e.g. your availability in a timely manner and schedule meetings without bothering your. To share a calendar in Outlook 2016, 2013, 2010 or 2007 you can use: native solutions available in Microsoft Outlook or a third party tool like CodeTwo Public Folders. To get more details about the above options, visit Microsoft websites about sharing calendar in Outlook 2016/2013, Outlook 2010 and Outlook 2007.
sending calendar snapshots can be time-consuming and, in the long term, rather annoying. 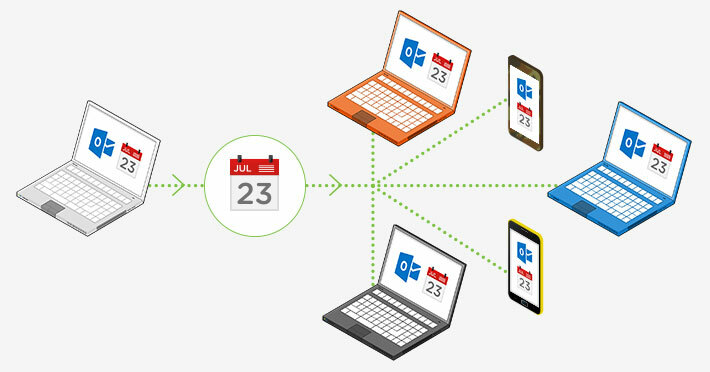 If the limitations mentioned above prevent you from doing your job effectively, you can use a third party application such as CodeTwo Public Folders – a smart tool for Outlook data sharing – to share your calendars automatically. CodeTwo Public Folders lets you share Outlook data between users, computers and mobile devices. 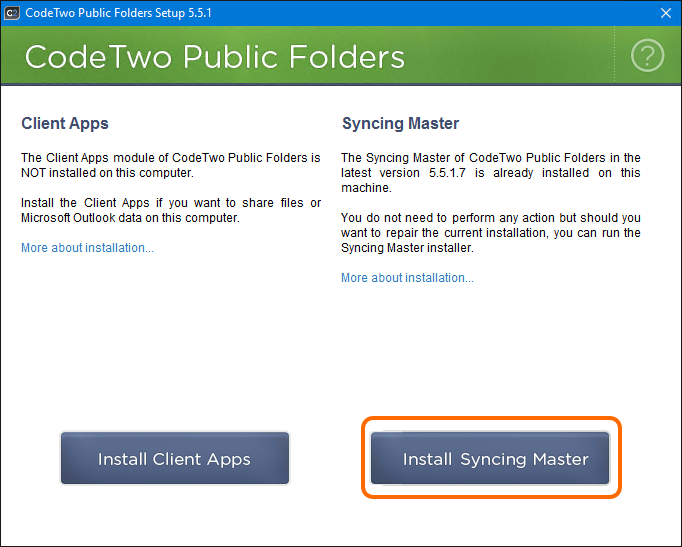 This self-sufficient application consists of two modules: the Syncing Master and the Client App. 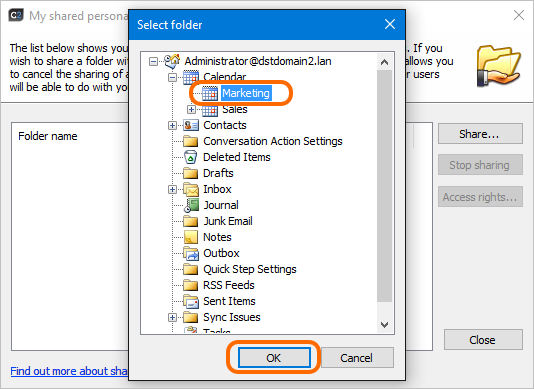 The first one serves as a program’s database and the administration panel and the second one is an Outlook add-in letting you take actions on shared folders. Note: If you have CodeTwo Public Folders already installed, skip this part. If you have not already installed the software, download it from this website and run the installer on your computer. 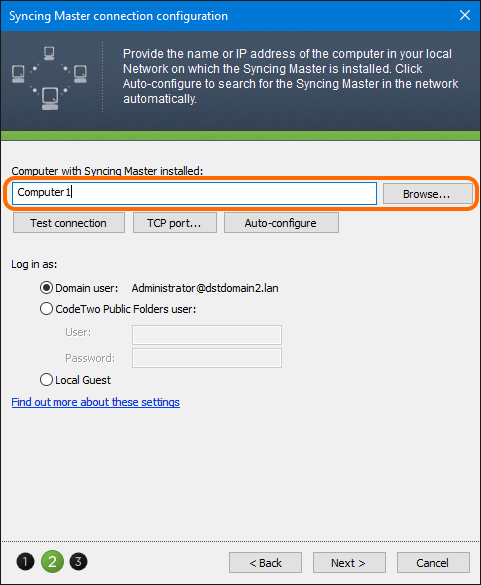 In the pop up window, select the Install Syncing Master option. This way you will install the Administration panel of the software. Then, follow the steps of the installation wizard. 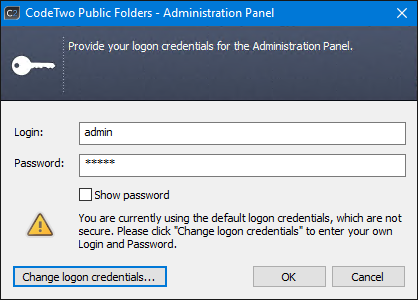 Once the program has been installed, it will ask you to provide administrator’s credentials. Click Change logon credentials to set up your own login and password. 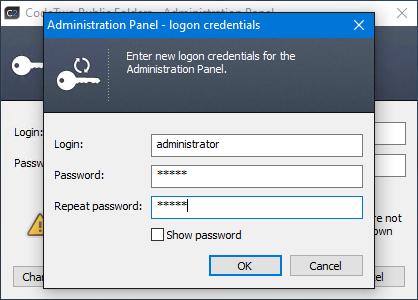 In the resulting window, provide your admin credentials and click OK.
Login to the Administration Panel with just set up login and password and click OK. Once you have successfully logged in, you should get access to the admin console. Now, it is time to install another module – the Client App – which allows to manage shared calendars from Outlook. 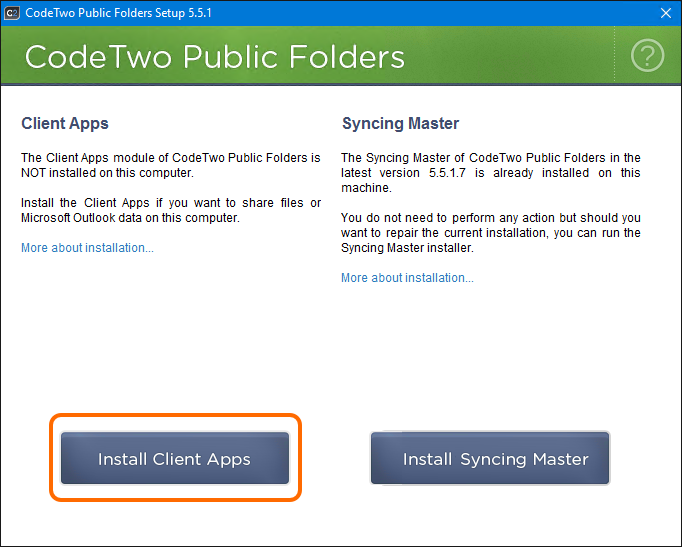 The next step, after installing the Syncing Master (the program’s Administration panel), is to install the Client Apps on user’s computers equipped with Outlook (you can install a client app on the Syncing Master machine as well – if there is Outlook data you want to share on this PC). Thanks to this app, users will be able to share their personal calendars (or other folders) and view calendars of others. To start, run the same installer that you have used to install the Syncing Master but this time select the Install Client Apps option. Follow the next-next-finish installation wizard to install the Client App on your computer with Outlook 2016, 2013, 2010 or 2007. Once you have installed the Client App, open your Microsoft Outlook. 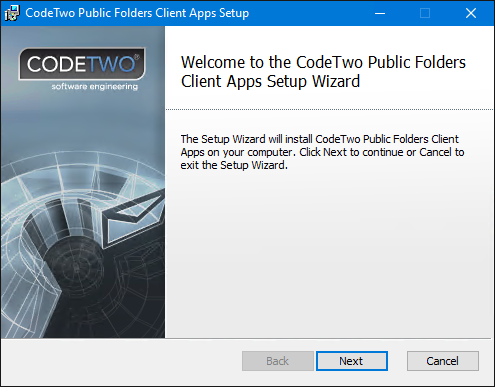 You should see CodeTwo Public Folders add-in displayed as: one of the tabs, under the Home menu and in the folder pane on the left (a new folder tree c2publicfolders is created). Now, as the program has been successfully installed, you can start sharing calendars. If you have already installed CodeTwo Public Folders (the Syncing Master and the Client Apps), you are almost ready to share your calendar with others. Let’s do some final configuration to start sharing Outlook calendars! Tap the Windows key on your keyboard (between the Ctrl and Alt buttons) and start typing CodeTwo. Once the Administration Panel appears in the search results, click it to open the console. In the Administration panel, navigate to the Users tab and click the New button to create users’ accounts that will allow to share Outlook data. You can select: Standard user (you manually set up credentials for the user), Active Directory user (you browse your Active Directory to add users) or Anonymous user (no credentials required). Note: By default on the list of users, there is a Local Guest user available. 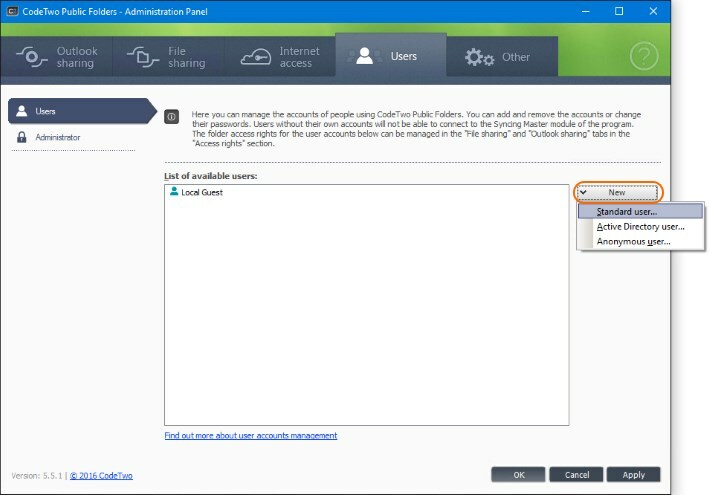 Thanks to this solution, users who just installed Client Apps on their Outlooks can start testing program’s functionalities without waiting for the administrator to create their accounts in the Syncing Master. Let’s use the Standard user as an example. 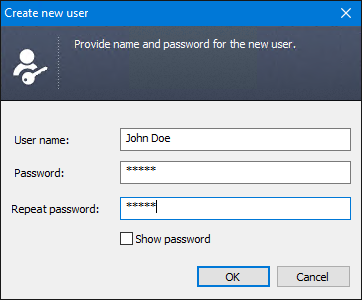 In the resulting window, provide a name and a password for that user. If you want to add more users, repeat the procedure. Note: Please remember to inform that user with the credentials so that she/he can connect their Client Apps to the Syncing Master and share their personal folders with others (unless you connect all Outlooks by yourself). 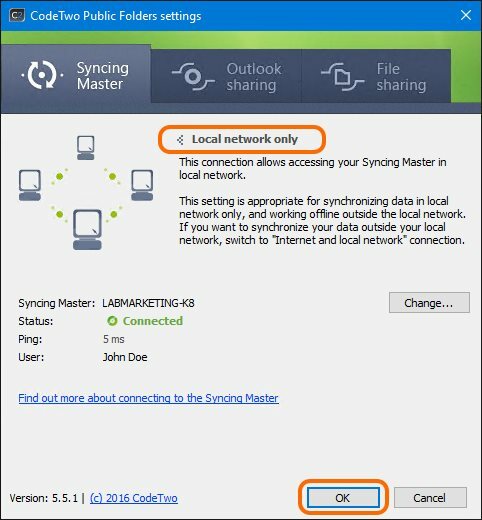 Now, go to Outlook to connect it to the Syncing Master using the already created user account. Click a green Online icon under the Home tab to start configuration. 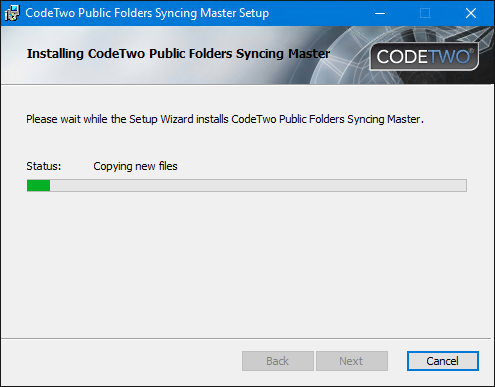 In the CodeTwo Public Folders settings window under the Syncing Master tab, click Change to set up a new connection. Important! At this moment, you are connected to a public Demo Server. It is highly recommended NOT to use this connection type for sharing personal Outlook data as it can be accessed by any person who currently trials CodeTwo Public Folders. Now, select the connection type you want to establish. 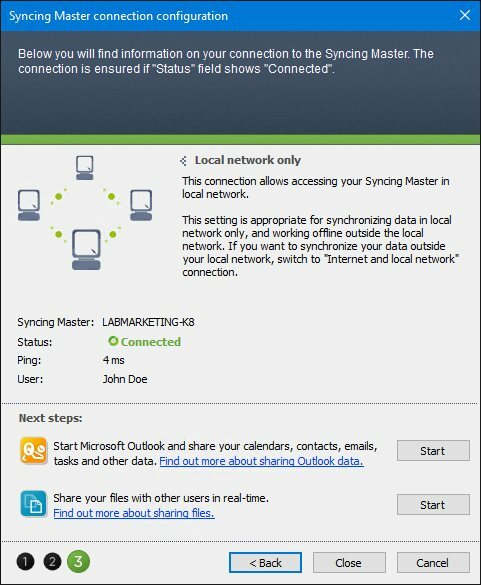 In this example, I will select Local network only to connect to the Syncing Master via the local network. 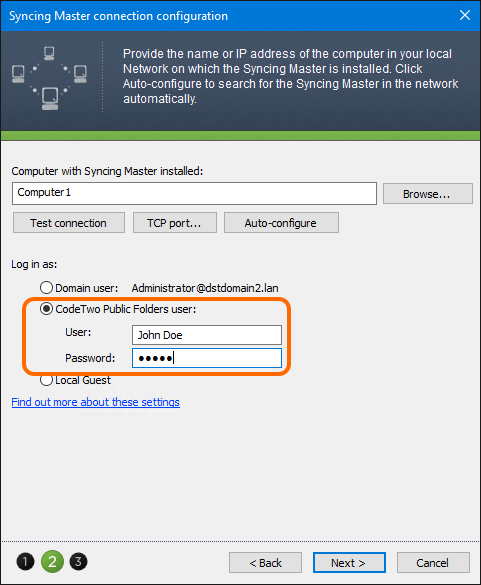 Next, enter a name or an IP number of the computer with the Syncing Master installed. You can also use the Browse button to find the computer. Next step is to provide the user’s credentials in the Log in as section. Provide the login and the password of your user created in step 3 above. In my example, it’s John Doe. Click Next when it’s done. The last step shows the connection details. Click Close to finish the configuration process. 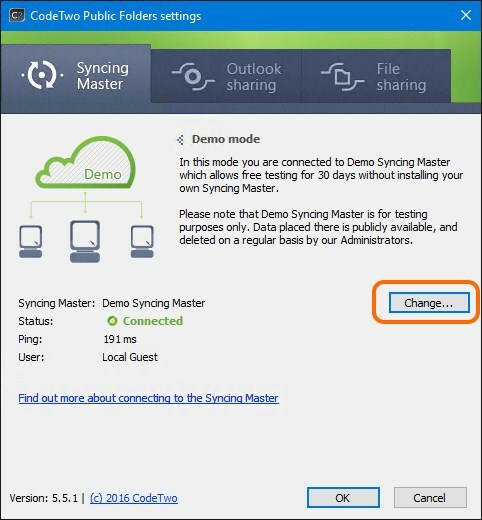 Now, the user (or, to be more precise, the Client App on the user’s Outlook) is connected to the Syncing Master. Click OK, and restart Outlook so that changes take effect. Repeat this procedure on every Outlook, which has calendars you want to share. Let’s share a personal calendar with other users, then! 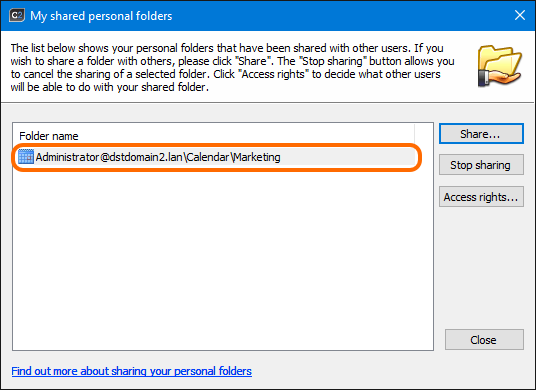 In Outlook, right click on your personal calendar you want to share and select Share this folder…. Decide who can work on this calendar and to what extent. 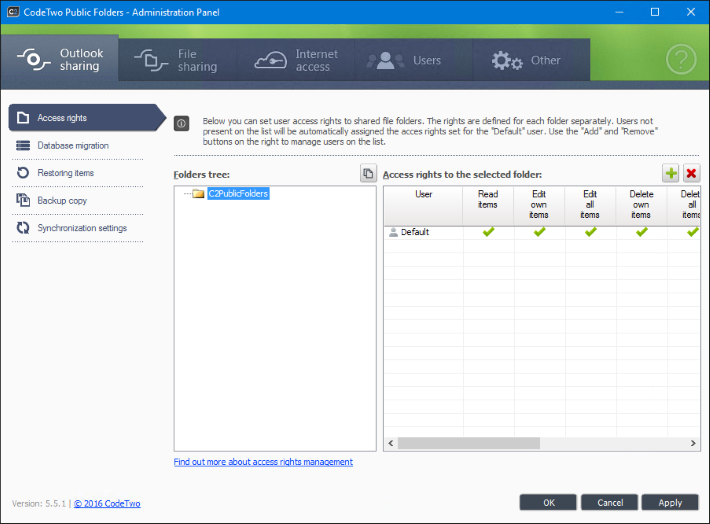 In the access rights window, select a user from the list (or add a new user with the Add user option) and assign them read, edit and delete rights. Click OK to share your calendar. Once your calendar has been shared you will see this notification. Click OK. In Outlook, go to the CodeTwo Public Folders tab and click My Shared Folders. Then, click Share to open a folder tree. 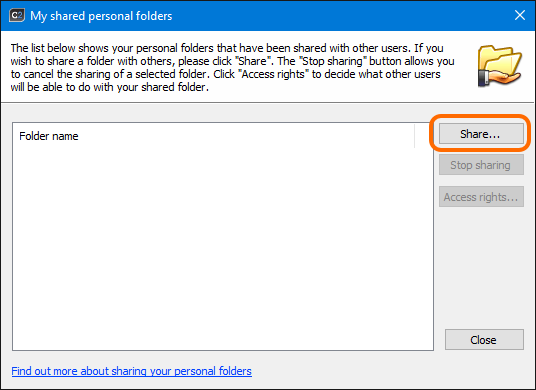 In the resulting window, select a calendar you want to share and click OK.
Now, the Access rights for the shared folder window should appear. Add or Remove users and assign them access rights to your calendar. Click OK to confirm changes. The calendar is now shared with other co-workers and it will appear on the list of your shared personal folders. Click Close to close the window. That’s it! Your personal calendar is now available for other people in your organization according to the access rights you specified for that calendar. But, this calendar will not appear automatically on other users computers unless it is manually opened in their Outlooks. To open a shared personal calendar, go to another computer, open Outlook and go to the CodeTwo Public Folders tab. 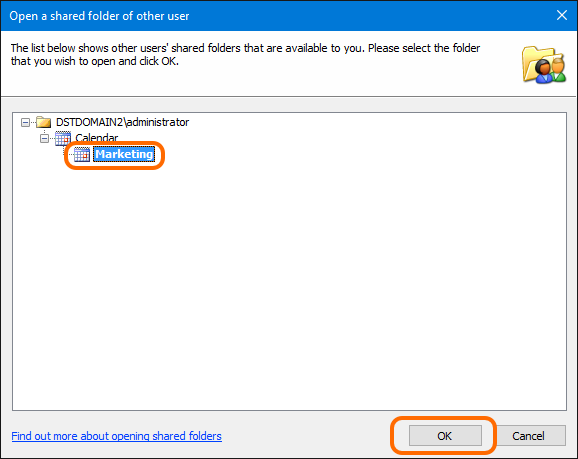 Then click Other users’ shared folders. 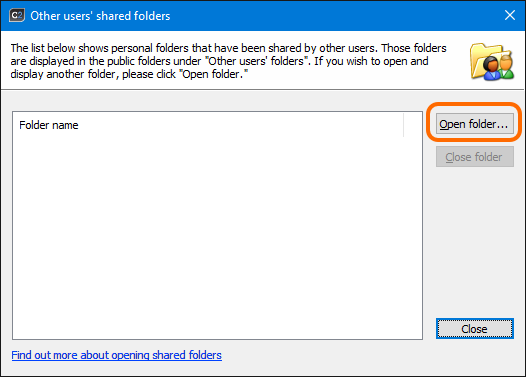 In the resulting window, click the Open folder button to see other users’ shared folders. Now, a list of all shared calendars should appear. Find the shared calendar you want to open and click OK.
Once the calendar has been opened, it appears on the list of opened folders. Click Close to close the window. 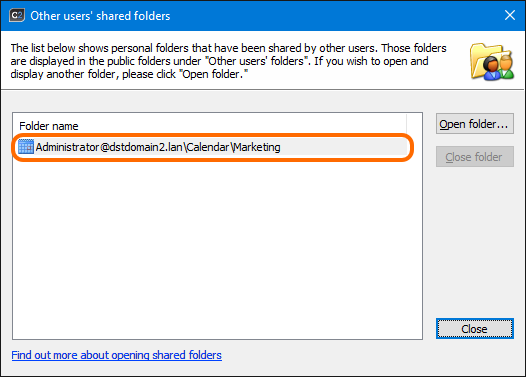 To see all currently opened calendars (or other folders) shared by other users, go to c2publicfolders tree on the left pane in Outlook and select Other user’s folders. Note: Other users’ shared calendars appear under Other users’ folders within the c2publicfolder tree, not under your personal folder tree. And that’s it! Now you can share your Outlook data with other users in real time. 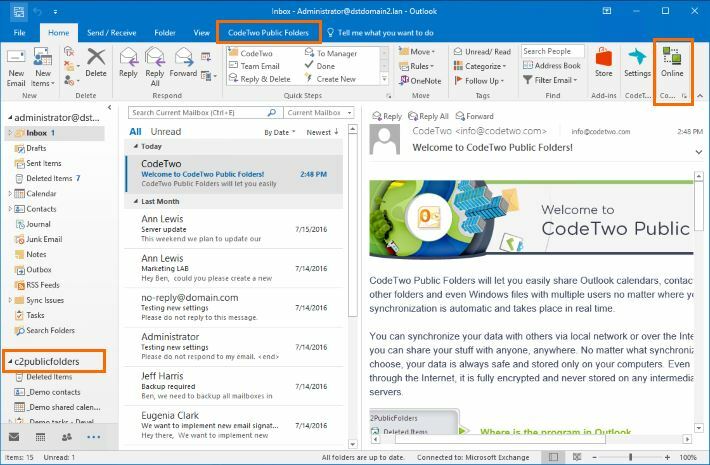 CodeTwo Public Folders will help you share not only calendars but also contacts, tasks and emails across all Outlook versions (2016-2003) in your organization. Does this mean will require license for users who is viewing the shared calendar or only license on user who create and share the calendar? Users need a license to install a Client App – which allows to create and view shared calendars and benefit from the rest of the software’s features. As a result, all users who want to view a shared calendar require a license. You can find out more about pricing of CodeTwo Public Folders on this site.